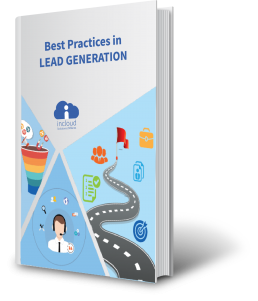 This article is the second of a series of «Best Practices in Lead Generation». Through the first posts of our series, we have seen how to prepare well to launch marketing campaigns. So, understanding your audience well is vital to knowing how to approach them. However, it is also important to present a well-crafted business plan to convince your entire organization to follow you on this journey. Now we will focus on lead generation. It is a very important element but it is not the only objective. There are often huge opportunities to seize with leads and existing customers. However, if your conversion rates from leads to opportunity and opportunities in business are adequate, you need to run more lines to catch more fish. There are two ways to do this: Inbound and Outbound Marketing. Inbound is attracting prospects to you through SEO (Search Engine Optimization) and Outbound refers to more conventional techniques like advertisements or events. Even if the marketing industry is trying to impose the Inbound as the new way forward, I think rather how these two techniques can coexist. We’ll see how in the next blog. With the sales funnel, different tactics can be put in place to manage leads when they arrive. Marketing has to put a foot even in the opportunities to help the sales to conclude. Throughout the sales funnel, various tactics can to be set up to generate and manage leads. Collaboration between Sales and Marketing is crucial to turn leads into sales revenue. Inbound Marketing is a rather new concept, really trendy and that allows to attract prospects with different contents to convert them into customers, without soliciting them. Quality content that answers questions or problems from your prospects and customers is a prerequisite for all successful campaigns. You have to see the marketing content as a hook or part of your expertise that you share for free in exchange for information about your prospects. The goal is to engage the conversation in a relevant way. Thus, the hooks we mentioned above could be webinars, e-books, videos, computer graphics. It can also help you differentiate yourself from your competition and build a relationship of trust with your prospects and customers. Although content creation has not yet been adopted by all companies, there are now many more followers. A good tip to differentiate yourself: put your customers in the foreground. Articles like case studies are often the type of content that resonates more with prospects. In addition, you must also adapt your content to the purchase cycle of your leads. For example, you attract prospects with an e-book that addresses the problems of your prospects, and you convert them into opportunities through a product comparison. Last but not least, do not hesitate to recycle your content: white papers and Ebooks can make the effect of several blog posts. To know if your strategy works, it is obviously necessary to have an eye on the number of downloads and leads created. But you also have to check if the collected leads match the profiles you are looking for. The goal is to convert visitors to your site into leads and educate them to become prospects and customers. Anyone looking for information on your site should find a way to communicate with you, which is specific to each moment of their purchase cycle (Download eBook or “I want a Demo”). The reading on the web is done in a fast way, it is thus necessary to optimize the text of your site so that one can see prominently the important elements and the points of conversion (Contact us for example, or download, receive the newsletter …). Your website must be clear. Do not use too many colors, and everything you say or show must be relevant. There are obviously a lot of indicators you need to keep an eye on. Google Analytics remains the tool of choice for this task, but if other software can give you more detail. At a high level, the key performance indicators for your site are the overall conversion rate per page, as well as the bounce rate. Having a blog allows you to inspire your readers and prospects. Through this, you can also build a relationship of trust and show the full range of expertise your business has. Facilitate sharing on social media: if your readers like your content, they must be able to share it on their favorite channels. Guide the audience toward conversion points and involve internal and external collaborators to write articles, to have more relevant and specific content. Analyze the success of your blog strategy with the visits, conversions and return on investment, or the performance of subjects and contents. Here, the goal is to increase trust in your brand. It also allows you to generate leads at low cost and extend your network. Alternate one curation publication, one promotion, and four education: do not just do promotion. Each position will have the effect of sharp thinking to find the right word, the right turn and the right image that will have the greatest impact on your audience. Analyze the visits, conversions and return on investment. In this case too, you can measure with the performance of subjects and contents. SEO has a key role in your Inbound Marketing strategy. This can be complex and often needs to be revised. But it is clearly the strategy that brings you the highest return on investment. To give you a little familiar picture: SEO is going to the gym, while online advertising (SEM) is cosmetic surgery! With SEO, you can generate low-cost leads and set up a steady flow of visits to your site. Talking about SEO can take centuries because the subject is vast and constantly changing. However, the basics of the strategy are to put in place a keyword strategy (specific to each page and blog post), to develop external links, what social media can also help you with. Analyze positioning by keyword and competition. Also, look at the share of traffic and organic source conversions. 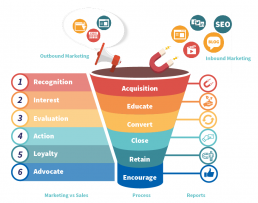 This gives you a quick overview of what Inbound Marketing is. In our next post, we will talk about Outbound Marketing, but especially about the combination of the two concepts.